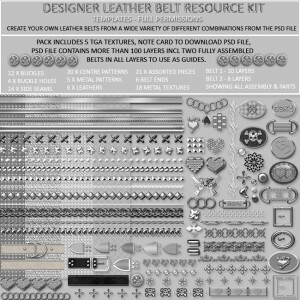 The ultimate Designer Leather Belt Resource Kit for content designers. 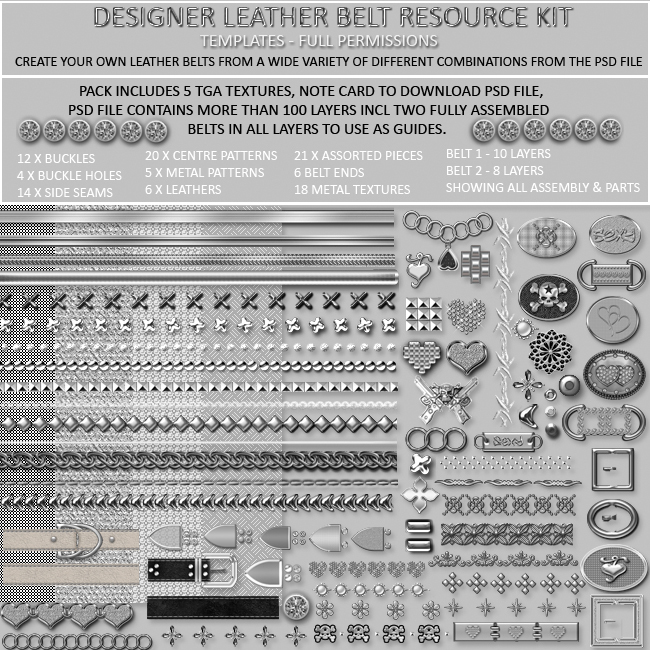 You can create hundreds of your own belts from a variety of difference combinations from the PSD file. Pack includes 5 TGA files (as examples) and notecard to download the PSD file with multi-layers and additional pieces. Over 100 pieces to make an unlimted amount of unique belts. Pieces included in this kit are metallic and chrome effect and can be used for your clothes creations too. Use this in conjunction with other resource kits available from TD Templates to build up your creators resource library. 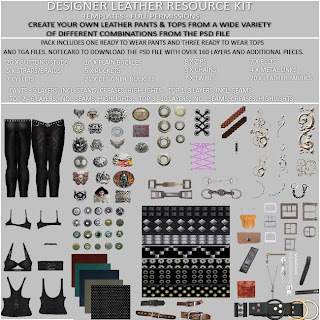 The ultimate Designer Leather Resource Kit for leather designers. Create your own jeans from a variety of difference combinations from the PSD file. Pack includes 1 ready to wear pants and 3 tops, TGA files and notecard to download the PSD file with multi-layers and additional pieces. 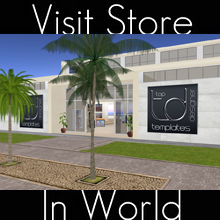 Over 160 pieces to make an unlimted amount of unique individual tops and pants. 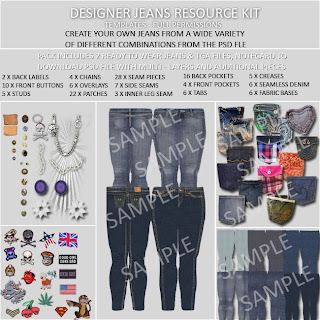 The ultimate Designer Jeans Resource Kit for jeans designers. Create your own jeans from a variety of difference combinations from the PSD file. Pack includes 2 ready to wear jeans, TGA files and notecard to download the PSD file with multi-layers and additional pieces. Over 125 pieces to make an unlimted amount of unique individual jeans.